As an Owner Education Consultant I have had the privilege of travelling around the South Pacific and visiting many of the WorldMark Resorts. I’ll be sharing with you my experiences, my recommendations and my hot tips.I hope that my insights will inspire you to explore destinations that were otherwise not on your holiday wish list. And I hope to encourage you to use your Ownership to break away and enjoy these places with your family and friends. 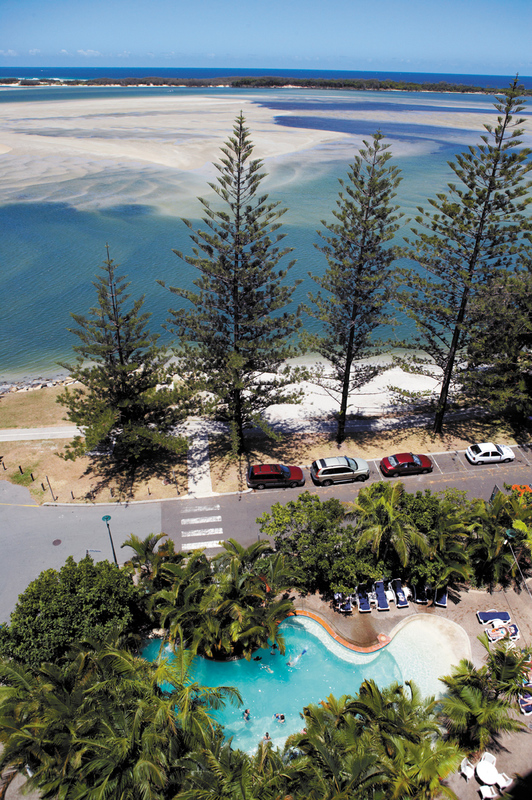 One of my favourite WorldMark Holidaying Destinations is the serenely beautiful Golden Beach Resort in Caloundra on the Sunshine Coast. This is a favourite because of the location overlooking the calm waterways of the Pumicestone passage. 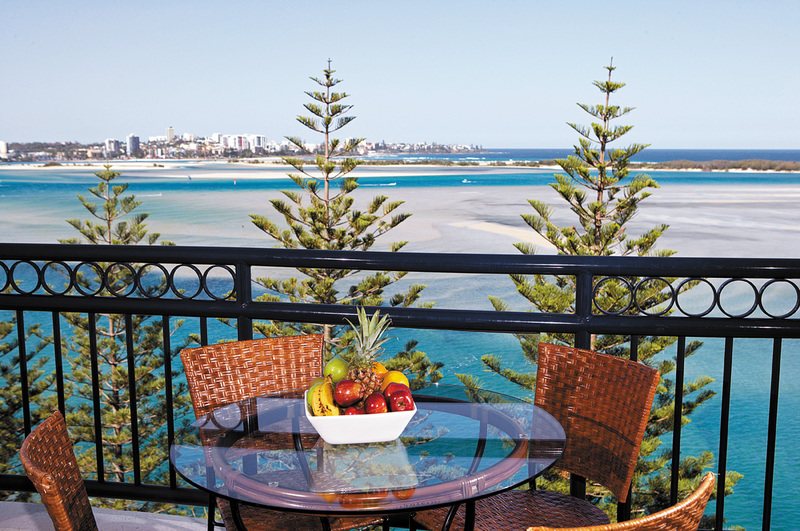 Each apartment has a generous sized balcony facing towards Caloundra, with views of the enormous pine trees, Bribie Island or the resort pool. It’s the first place I run to when I check into my apartment and dump all my bags. I love the view! It instantly has this calming effect that immediately makes me feel like I’m on holiday. Whether it’s watching the sun rise over Bribie Island or watching the sun set over the Glass House Mountains Golden Beach has a view that’s hard to beat! Caloundra is a perfect spot to try out some water activities, even if it is for the first time. The Pumicestone passage is protected by Bribie Island so the water is quite calm and a great playground to have fun learning something new. You can start off gently taking out a kayak or why not learn how to sail on a catamaran or for something a little more adventurous why not try the kite surfing! Golden Beach Hire is a really friendly place just down from the resort where you can hire equipment on an hourly basis and they will teach you how to get started. If you prefer something a little slower paced, then check out the Eumundi markets on a Saturday morning. These are an excellent way for you to familiarise yourself with the local delicacies, artwork or craftwork. Australia Zoo is another really popular attraction whilst staying at Golden Beach – it’s an interesting day trip for the entire family. When it comes to eating, there are heaps of choices. Firstly I would recommend the resort BBQ area as an inexpensive way to feed the family. It’s also a great way to meet other Owners and hear their travel stories! Otherwise my personal recommendation is the Thai restaurant onsite, they just serve the freshest, tastiest most fragrant Thai and I just love it. Tip: you can ring the restaurant from your room and order take-away and charge it back to your room. Alternatively the resort is surrounded by cafes, take away outlets and other restaurants. I recommend the Power Boat Club which is only a short walk up the road as a fun night out! Golden Beach is an ideal place for a relaxing break, however long your stay is at Golden Beach you will be sure to unwind. Have you stayed at Golden Beach? What are some of the activities that you enjoyed? Great timing..we’re heading there tomorrow, very excited. Fantastic information on the area as well as the resort. Certainly want to stay there. I look forward to more of your travel experiences. Hi Priscilla, thanks so much for your positive feedback. I look forward to sharing my stories with you.